This article is about the film. For the idiom, see The living daylights (idiom). For other uses, see The Living Daylights (disambiguation). James Bond is assigned to aid the defection of a KGB officer, General Georgi Koskov, covering his escape from a concert hall in Bratislava, Czechoslovakia during intermission. 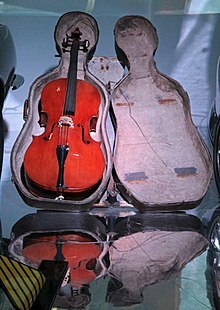 During the mission, Bond notices that the KGB sniper assigned to prevent Koskov's escape is a female cellist from the orchestra. Disobeying his orders to kill the sniper, he instead shoots the rifle from her hands, then uses the Trans-Siberian Pipeline to smuggle Koskov across the border into Austria and then on to Britain. In his post-defection debriefing, Koskov informs MI6 that the KGB's old policy of 'Smiert Spionam', meaning 'Death to Spies', has been revived by General Leonid Pushkin, the new head of the KGB. Koskov is later abducted from the safe-house and assumed to have been taken back to Moscow. Bond is directed to track down Pushkin in Tangier and kill him, to forestall further killings of agents and escalation of tensions between the Soviet Union and the West. Bond agrees to carry out the mission when he learns that the assassin who killed 004 (as depicted in the pre-title sequence) left a note bearing the same message, "Smiert Spionam". Bond returns to Bratislava to track down the cellist, Kara Milovy. He finds out that Koskov's entire defection was staged, and that Kara is actually Koskov's girlfriend. Bond convinces Kara that he is a friend of Koskov's. and persuades her to accompany him to Vienna, supposedly to be reunited with him. They escape Bratislava while being pursued by the KGB, crossing over the border into Austria. Meanwhile, Pushkin meets with an arms dealer, Brad Whitaker, in Tangier, informing him that the KGB is cancelling an arms deal previously arranged between Koskov and Whitaker. During his brief tryst with Milovy in Vienna, Bond visits the Prater to meet his MI6 ally, Saunders, who discovers a history of financial dealings between Koskov and Whitaker. As he leaves their meeting, Saunders is killed by Koskov's henchman Necros, who again leaves the message "Smiert Spionam". Bond and Kara promptly leave for Tangier, where Bond confronts Pushkin, who disavows any knowledge of "Smiert Spionam" and reveals that Koskov is evading arrest for embezzlement of government funds. Bond and Pushkin then join forces, and Bond fakes Pushkin's assassination, inducing Whitaker and Koskov to progress with their scheme. Meanwhile, Kara contacts Koskov, who tells her that Bond is actually a KGB agent, and convinces her to drug him so that he can be captured. Koskov, Necros, Kara, and the captive Bond fly to a Soviet air base in Afghanistan, where Koskov betrays Kara and imprisons her, along with Bond. The pair escape, and in doing so, free a condemned prisoner, Kamran Shah, leader of the local Mujahideen. Bond and Milovy discover that Koskov is using Soviet funds to buy a massive shipment of opium from the Mujahideen, intending to keep the profits with enough left over to supply the Soviets with their arms and buy Western arms from Whitaker. With the Mujahideen's help, Bond plants a bomb aboard the cargo plane carrying the opium, but is spotted and has no choice but to barricade himself in the plane. Meanwhile, the Mujahideen attack the air base on horseback and engage the Soviets in a gun battle. During the battle, Milovy drives a jeep into the cargo hold of the plane as Bond takes off, and Necros also leaps aboard at the last second. After a struggle, Bond throws Necros to his death and deactivates the bomb. Bond then notices Shah and his men being pursued by Soviet forces. He re-activates the bomb and drops it out of the plane and onto a bridge, blowing it up and helping Shah and his men escape the Soviets. Bond returns to Tangier to kill Whitaker, infiltrating his estate with the help of his ally Felix Leiter, as Pushkin arrests Koskov, sending him back to Moscow. Some time later, Kara is the solo cellist in a Vienna performance. Kamran Shah and his men arrive during the intermission and are introduced to now-diplomat General Gogol and the Soviets. After her performance, Bond surprises Kara in her dressing room, and they embrace. Robert Brown as M: The head of MI6 and Bond's superior. Catherine Rabett and Dulice Liecier as Liz and Ava: two CIA agents assisting Felix Leiter. Nadim Sawalha cameos as a police chief in Tangier. Sawalha also appeared in a previous 007 film, The Spy Who Loved Me (1977), as Aziz Fekkesh. Originally the film was proposed to be a prequel in the series, an idea that eventually resurfaced with the reboot of the series in 2006. SMERSH, the fictionalised Soviet counterintelligence agency that featured in Fleming's Casino Royale and several other early James Bond novels, was an acronym for 'Smiert Shpionam' - 'Death to spies'. "I felt it would be wrong to pluck the character out of thin air, or to base him on any of my predecessors' interpretations. Instead, I went to the man who created him, and I was astonished. I'd read a couple of the books years ago, and I thought I'd find them trivial now, but I thoroughly enjoyed every one. It's not just that they've a terrific sense of adventure and you get very involved. On those pages I discovered a Bond I'd never seen on the screen, a quite extraordinary man, a man I really wanted to play, a man of contradictions and opposites." In autumn 1985, following the financial and critical disappointment of A View to a Kill, work began on scripts for the next Bond film, with the intention that Roger Moore would not reprise the role of James Bond. Moore, who by the time of the release of The Living Daylights would have been 59 years old, chose to retire from the role after 12 years and 7 films. Albert Broccoli, however, claimed that he let Moore go from the role. An extensive search for a new actor to play Bond saw a number of actors, including New Zealander Sam Neill, Irish-born Pierce Brosnan and Welsh-born stage actor Timothy Dalton audition for the role in 1986. Bond co-producer Michael G. Wilson, director John Glen, Dana and Barbara Broccoli "were impressed with Sam Neill and very much wanted to use him." However, Albert Broccoli was not sold on the actor. 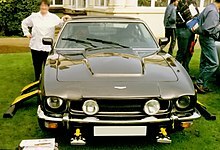 The official car, the Aston Martin V8 Vantage (Series 2), at a James Bond convention. The producers eventually offered the role to Brosnan after a three-day screen-test. At the time, he was contracted to the television series Remington Steele, which had been canceled by the NBC network due to falling ratings. The announcement that he would be chosen to play James Bond caused a surge in interest in the series, which led to NBC exercising (less than three days prior to expiry) a 60-day option in Brosnan's contract to make a further season of the series. NBC's action caused drastic repercussions,α as a result of which Broccoli withdrew the offer given to Brosnan, citing that he did not want the character associated with a contemporary television series. This led to a drop in interest in Remington Steele, and only five new episodes were filmed before the series was finally cancelled. The edict from Broccoli was that "Remington Steele would not be James Bond." Dana Broccoli suggested Timothy Dalton. Albert Broccoli was initially reluctant given Dalton's public lack of interest in the role, but at his wife's urging agreed to meet the actor. However, Dalton would soon begin filming Brenda Starr and so would be unavailable. In the intervening period, having completed Brenda Starr Dalton was offered the role once again, which he accepted. For a period, the filmmakers had Dalton, but he had not signed a contract. A casting director persuaded Robert Bathurst - an English actor who would become known for his roles in Joking Apart, Cold Feet - and Downton Abbey to audition for Bond. Bathurst believes that his "ludicrous audition" was only "an arm-twisting exercise" because the producers wanted to persuade Dalton to take the role by telling him they were still auditioning other actors. Dalton agreed to the film while travelling between airports: "Without anything to do, I decided to start thinking about whether I really, really should or should not do James Bond. Although obviously we’d moved some way along in that process, I just wasn’t set on whether I should do it or shan’t I do it. But the moment of truth was fast approaching as to whether I’d say yes or no. And that’s where I said yes. I picked up the phone from the hotel room in the Miami airport and called them and said, “Yep, you’re on: I’ll do it.” Dalton's take was very different to that of Moore, regarded as much more of a reluctant hero following an undeniable influence of the Fleming Bond in the way that the veteran agent was often uncomfortable in his job. Dalton wished to create a different Bond to Moore, feeling he would have declined the project if he were asked to imitate Moore. In contrast to Moore's more jocular approach, Dalton found his creative muse from the original books: "I definitely wanted to recapture the essence and flavour of the books, and play it less flippantly. After all, Bond's essential quality is that he's a man who lives on the edge. He could get killed at any moment, and that stress and danger factor is reflected in the way he lives, chain-smoking, drinking, fast cars and fast women." Moore declined to watch The Living Daylights in cinema as he did not wish to demonstrate any negative opinions about the project. Broccoli enjoyed the change of tone, feeling that Brosnan would have been too similar to Moore. Neill thought Dalton performed well in the role and Brosnan called Dalton a good choice in 1987, but felt it too near the bone to watch the finished film. He would win the role in 1994, based on his filmed audition from 1986. Sean Connery approved of Dalton in an interview, and Desmond Llewelyn enjoyed working with a fellow stage actor. The English actress Maryam d'Abo, who was also a former model, was cast as the Czechoslovakian cellist Kara Milovy. In 1984, d'Abo had attended auditions for the role of Pola Ivanova in A View to a Kill. Barbara Broccoli included d'Abo in the audition for playing Kara, which she later passed. Originally, the KGB general set up by Koskov was to be General Gogol; however, Walter Gotell was too sick to handle the major role, and the character of Leonid Pushkin replaced Gogol, who appears briefly at the end of the film, having transferred to the Soviet diplomatic service. This was Gogol's final appearance in a James Bond film. Morten Harket, the lead vocalist of the Norwegian rock group A-ha (which performed the film's title song), was offered a small role as a villain's henchman in the film, but declined, because of lack of time and because he felt they wanted to cast him due to his popularity rather than his acting. John Rhys Davies was optioned to revive his part in both Licence To Kill and GoldenEye in the scripting stages. Joe Don Baker was hired based on his performance in Edge of Darkness, which was helmed by future Bond director Martin Campbell. Director John Glen decided to include the macaw from For Your Eyes Only. It can be seen squawking in the kitchen of Blayden House when Necros attacks MI6's officers. Other actors considered for the role of James Bond included Mel Gibson, Mark Greenstreet, Lambert Wilson, Antony Hamilton, Christopher Lambert, Finlay Light, and Andrew Clarke. The film was shot at Pinewood Studios at its 007 Stage in the United Kingdom, as well as Weissensee in Austria. The pre-title sequence was filmed on the Rock of Gibraltar and although the sequence shows a hijacked Land Rover careering down various sections of road for several minutes before bursting through a wall towards the sea, the location mostly used the same short stretch of road at the very top of the Rock, shot from numerous different angles. The beach defences seen at the foot of the Rock in the initial shot were also added solely for the film, to an otherwise non-military area. The action involving the Land Rover switched from Gibraltar to Beachy Head in the UK for the shot showing the vehicle actually getting airborne. Trial runs of the stunt with the Land Rover, during which Bond escapes by parachute from the tumbling vehicle, were filmed in the Mojave Desert, although the final cut of the film uses a shot achieved using a dummy. Other locations included Germany, the United States, and Italy, while the desert scenes were shot in Ouarzazate, Morocco. The conclusion of the film was shot at the Schönbrunn Palace, Vienna and Elveden Hall, Suffolk. Principal photography commenced at Gibraltar on 17 September 1986. Aerial stuntmen B. J. Worth and Jake Lombard performed the pre-credits parachute jump. Both the terrain and wind were unfavourable. Consideration was given to the stunt being done using cranes but aerial stunts arranger B. J. Worth stuck to skydiving and completed the scenes in a day. The aircraft used for the jump was a C-130 Hercules, which in the film had M's office installed in the aircraft cabin. The initial point of view for the scene shows M in what appears to be his usual London office, but the camera then zooms out to reveal that it is, in fact, inside an aircraft. Although marked as a Royal Air Force aircraft, the one in shot belonged to the Spanish Air Force and was used again later in the film for the Afghanistan sequences, this time in "Russian" markings. During this later chapter, a fight breaks out on the open ramp of the aircraft in flight between Bond and Necros, before Necros falls to his death. Although the plot and preceding shots suggest the aircraft is a C-130, the shot of Necros falling away from the aircraft show a twin engine cargo plane, a C-123 Provider. Worth and Lombard also doubled for Bond and Necros in the scenes where they are hanging on a bag in a plane's open cargo door. The press would not meet Dalton and d'Abo until 5 October 1986, when the main unit travelled to Vienna. Almost two weeks after the second unit filming on Gibraltar, the first unit started shooting with Andreas Wisniewski and stunt man Bill Weston. During the course of the three days it took to film this fight, Weston fractured a finger and Wisniewski knocked him out once. The next day found the crew on location at Stonor House, doubling for Bladen's Safe House, the first scene Jeroen Krabbé filmed. The film reunites Bond with the car maker Aston Martin. Following Bond's use of the Aston Martin DBS in On Her Majesty's Secret Service, the filmmakers then turned to the brand new Lotus Esprit in 1977's The Spy Who Loved Me, which reappeared four years later in For Your Eyes Only. Despite the iconic status of the submersible Lotus however, Bond's Aston Martin DB5 is recognised as the most famous of his vehicles. As a consequence, Aston Martin returned with their V8 Vantage. Two different Aston Martin models were used in filming—a V8 Volante convertible, and later for the Czechoslovakia scenes, a hard-top non-Volante V8 saloon badged to look like the Volante. The Volante was a production model owned by Aston Martin Lagonda chairman, Victor Gauntlett. The Living Daylights was the final Bond film to be scored by composer John Barry. The soundtrack is notable for its introduction of sequenced electronic rhythm tracks overdubbed with the orchestra—at the time, a relatively new innovation. The title song of the film, "The Living Daylights", was co-written with Pål Waaktaar of the Norwegian pop-music group A-ha and recorded by the band. The group and Barry did not collaborate well, resulting in two versions of the theme song. Barry's film mix is heard on the soundtrack (and on A-ha's later compilation album Headlines and Deadlines). The version preferred by the band can be heard on the A-ha album Stay on These Roads, released in 1988. However, in 2006, Waaktaar-Savoy complimented Barry's contributions: "I loved the stuff he added to the track, I mean it gave it this really cool string arrangement. That's when for me it started to sound like a Bond thing". The title song is one of the few 007 title songs that is not performed or written by a British or American performer. In a departure from previous Bond films, The Living Daylights was the first to use different songs over the opening and end credits. The song heard over the end credits, "If There Was A Man", was one of two songs performed for the film by Chrissie Hynde of The Pretenders. The other song, "Where Has Everybody Gone", is heard from Necros's Walkman in the film. The Pretenders were originally considered to perform Daylights' title song. However, the producers had been pleased with the commercial success of Duran Duran's "A View to a Kill", and felt that A-ha would be more likely to make an impact on the charts. The original soundtrack was released on LP and CD by Warner Bros. and featured only 12 tracks. Later re-releases by Rykodisc and EMI added nine additional tracks, including alternate instrumental end credits music. Rykodisc's version included the gunbarrel and opening sequence of the film as well as the jailbreak sequence, and the bombing of the bridge. Additionally, the film featured a number of pieces of classical music, as the main Bond girl, Kara Milovy, is a cellist. Mozart's 40th Symphony in G minor (1st movement) is performed by the orchestra at the Conservatoire in Bratislava when Koskov flees. As Moneypenny tells Bond, Kara is next to perform Alexander Borodin's String Quartet in D major, and the finale to Act II of Mozart's The Marriage of Figaro (in Vienna) also features. Before Bond is drugged by Kara, she is practising the Cello solo from the first movement of Dvořák's cello concerto in B minor. At the end of the film, Kara and an orchestra (conducted onscreen by John Barry) perform Tchaikovsky's Rococo Variations to rapturous applause. The Prince and Princess of Wales attended the film's premiere on 29 June 1987 at the Odeon Leicester Square in London. The Living Daylights grossed the equivalent of $191.2 million worldwide. In the United States it earned $51,185,000, including an opening weekend of $11,051,284, surpassing the $5 million grossed by The Lost Boys that was released on the same day. In the film, Koskov and Whitaker repeatedly use vehicles and drug packets marked with the Red Cross. This action angered a number of Red Cross Societies, which sent letters of protest regarding the film. In addition, the British Red Cross attempted to prosecute the filmmakers and distributors. However, no legal action was taken. As a result, a disclaimer was added at the start of the film and some DVD releases. The review-aggregation website Rotten Tomatoes gives the film a score of 71% based on reviews from 52 critics, and a weighted average of 6.4 out of 10. The website's critical consensus states, "Newcomer Timothy Dalton plays James Bond with more seriousness than preceding installments, and the result is exciting and colorful but occasionally humorless." IGN lauded the film for bringing back realism and espionage to the film series, and showing James Bond's dark side. The Washington Post even said Dalton developed "the best Bond ever." While Roger Ebert in the Chicago Sun-Times criticised the lack of humour in the protagonist, Jay Scott of The Globe and Mail wrote of Dalton's Bond that "you get the feeling that on his off nights, he might curl up with the Reader's Digest and catch an episode of Moonlighting". Dalton himself has said he preferred The Living Daylights over Licence to Kill. Roger Moore, discussing the Bond series in 2012, called The Living Daylights a "bloody good movie". ^α Not only did Brosnan lose out on the role of James Bond, but his Remington Steele co-star, Stephanie Zimbalist, was also forced to withdraw from her lead role in the science-fiction film RoboCop. ^ a b Michael G. Wilson. Inside The Living Daylights (DVD). ^ "007: A NEW BOND MEETS THE NEW WOMAN; TIMOTHY DALTON FINDS A HAMLET IN THE HERO". The New York Times. 26 July 1987. Retrieved 13 August 2018. ^ a b c Broccoli & Zec 1998, p. 276. ^ a b Broccoli & Zec 1998, p. 281. ^ John Glen. Inside The Living Daylights (DVD). ^ Sanderson Healy, Laura; Norbom, Mary Ann (11 August 1986). "The Spy Who's Loved Too Much". People Magazine. Retrieved 4 November 2015. ^ Last, Kimberly (1996). "Pierce Brosnan's Long and Winding Road To Bond". Archived from the original on 9 October 2006. Retrieved 22 February 2007. ^ Peter Lamont. Inside The Living Daylights (DVD). ^ a b Patrick Macnee. Inside The Living Daylights (DVD). ^ Maryam d'Abo. Inside The Living Daylights (DVD). ^ McCaffrey, Julie (22 February 2003). "Bathurst's cure for cold feet". Edinburgh Evening News. Retrieved 8 February 2009. ^ Duncan, Paul. "The James Bond Archives"
^ "The Living Daylights". MI6-HQ.com. Retrieved 11 October 2007. ^ John Richardson. Inside The Living Daylights. ^ Jake Lombard. Inside The Living Daylights (DVD). ^ B.J. Worth, Jake Lombard, Arthur Wooster. Inside The Living Daylights. ^ Andreas Wisniewski. Inside The Living Daylights (DVD). ^ Jeroen Krabbé. Inside The Living Daylights. ^ "007 V8 Vantage/Volante". Astonmartins.com. Retrieved 18 December 2014. ^ a b James Bond's Greatest Hits (Television). UK: North One Television. 2006. ^ "The Living Daylights". Fastrac Publications. Archived from the original on 23 October 2007. Retrieved 11 October 2007. ^ "The Living Daylights". SoundtrackNet. Retrieved 7 October 2007. ^ Campbell, Margaret, The Great Cellists (North Pomfret, Vermont: Trafalgar Square Publishing, 1988). ^ Burlingame, Jon (2012). The Music of James Bond. Oxford University Press. ISBN 9780199986767. ^ "Box Office History for James Bond Movies". The-numbers.com. Retrieved 6 October 2007. ^ "The Living Daylights". Box Office Mojo. Retrieved 6 October 2007. ^ "The Living Daylights: Weekend collections". Box Office Mojo. Retrieved 6 October 2007. ^ "1987 Domestic Grosses". Box Office Mojo. Retrieved 6 October 2007. ^ "Protecting the Emblems in peacetime: the experiences of the British Red Cross Society". Retrieved 7 October 2007. ^ "Protection of the red cross and red crescent emblems and the repression of misuse". Icrc.org. 31 October 1989. Retrieved 1 May 2010. ^ "The Living Daylights". Rotten Tomatoes. Retrieved 25 January 2019. ^ "James Bond's Top 20 – Movies feature – at IGN". Movies.ign.com. Retrieved 1 May 2010. ^ "'The Living Daylights' (PG)". The Washington Post. 31 July 1987. Retrieved 1 May 2010. ^ Roger Ebert (31 July 1987). "The Living Daylights Movie Review". Chicago Sun-Times. Retrieved 9 January 2014. ^ Scott, Jay (3 August 1987). 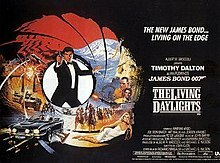 "The Living Daylights: Dalton serves up lethargic James Bond. A licence to bore?". The Globe and Mail. p. C.7. ^ Stephanie Zimbalist (24 November 2003). "Actress Roles Over 40? 'It's a Big Fat Zero'". New York Observer (Interview). Interviewed by Alexandra Jacobs. Archived from the original on 29 April 2014. Retrieved 29 April 2014. Wikimedia Commons has media related to The Living Daylights (film).